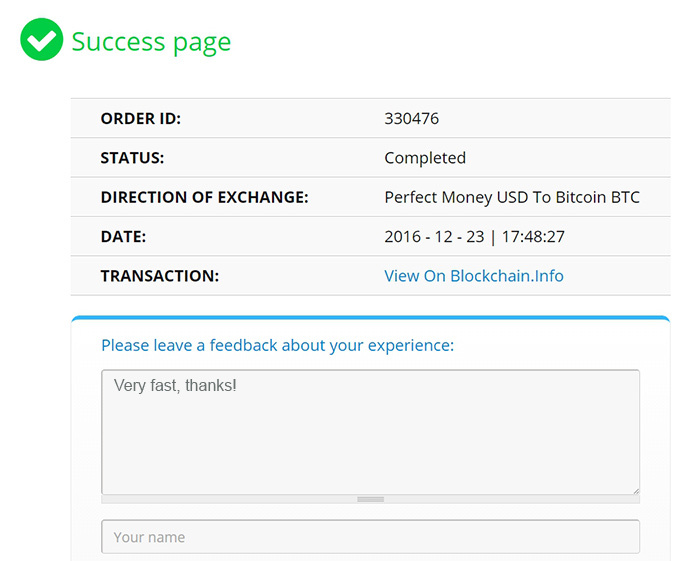 Here, we will tell in detail how to buy Bitcoin with PerfectMoney using ALFAcashier. Our manual will guide you through your first purchase of crypto currency available in the website making it fast and clear. Just follow the described steps. Payment method 1. 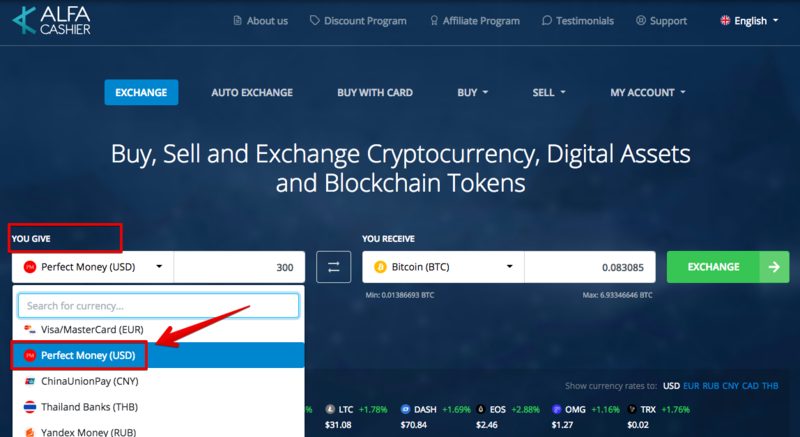 Purchasing Bitcoin at BUY page. 2.1 Further, enter the amount you are willing to spend on purchasing the cryptocurrency. 2.2 The system automatically calculates the amount you get taking into account the current exchange rate, the fee and your personal discount, if any. 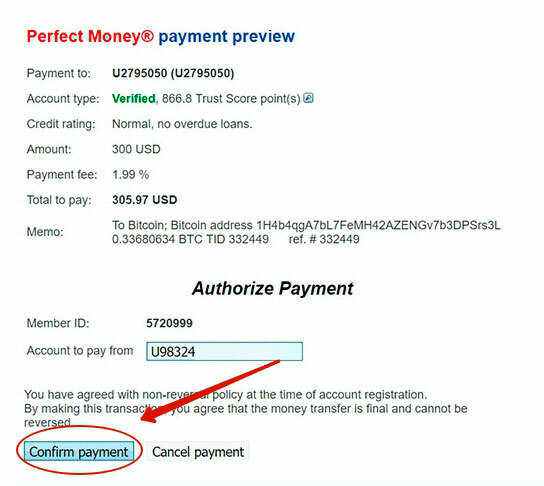 2.3 Choose the payment method (in our case, Perfect Money). 2.4 Below you see the minimum and maximum amounts that set the upper and lower limits of the amounts you can exchange, respectively. If you are willing to exchange a larger amount, please contact our support service by sending your request for the amount you need right from this page. 3. Next, enter the requested data. In our case, we enter PerfectMoney data and Bitcoin wallet address. If you have the saved wallets, for your convenience you can use them, so that the system could fill in the details automatically. 5. Click Send to get to the Perfect Money payment page, where you should choose the preferred payment method and click "Make Payment". 6. After filling in the data required to authorize the payment, click "View Payment". 7. Further, Perfect Money window that displays the current payment info is opened. 8. After Confirming the payment, you are directed to the Payment in ALFAcashier Successfully Completed page. Congratulations! Your order has been fulfilled! For your convenience, a message with detailed information of the completed order will be e-mailed to you. 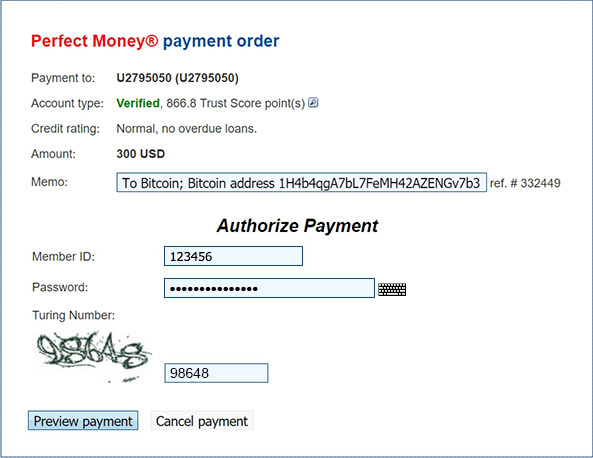 Payment method 2. 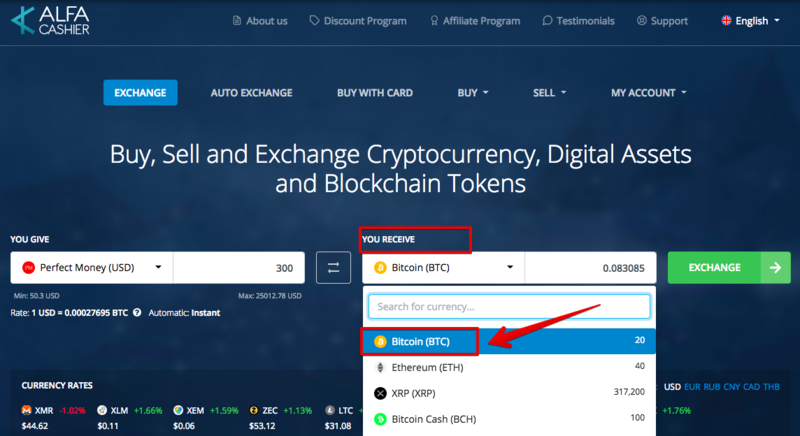 Purchasing Bitcoins via the HOME page. 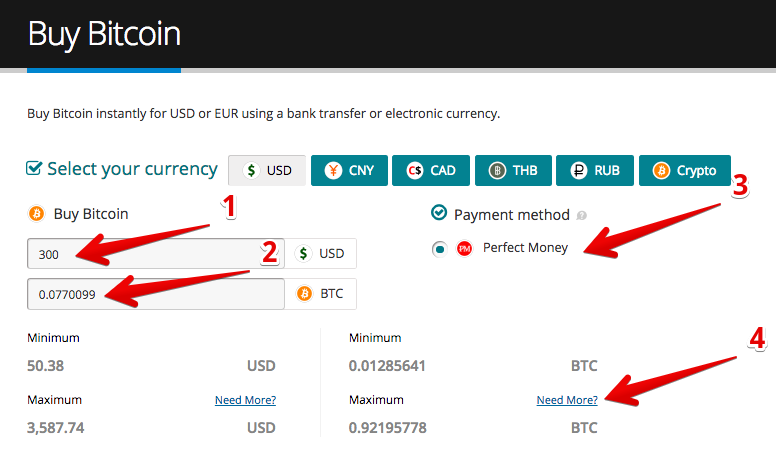 ​2.2 The system automatically calculates the amount you get taking into account the current exchange rate, the fee and your personal discount, if any. 2.3 Next, fill in the data of payment system accounts. In our case, we enter PerfectMoney data and Bitcoin wallet address. 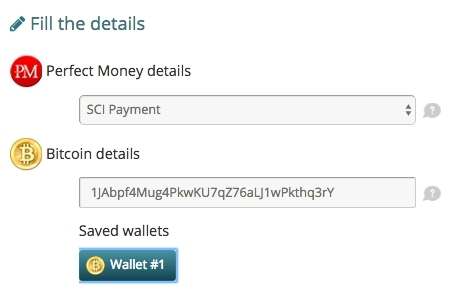 For your convenience, you can also save the wallet so that the next time you could fill in the details in one click. 3. 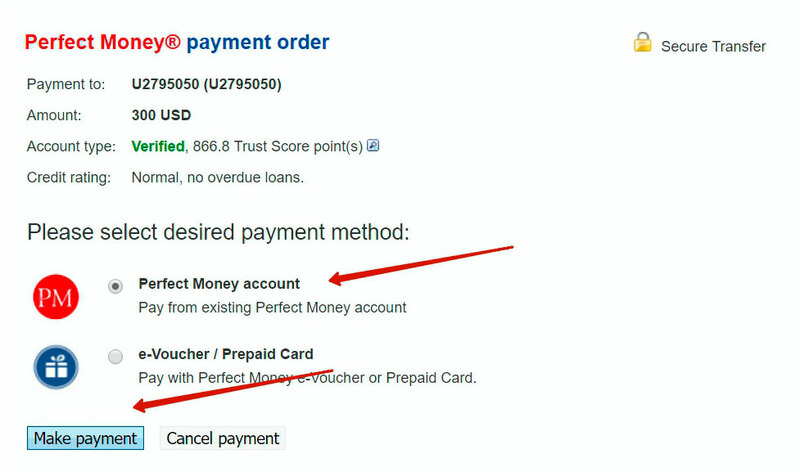 Click Send to get to the Perfect Money payment page, where you should choose the preferred payment method and click "Make Payment". 4. After filling in the data required to authorize the payment, click "View Payment". 5. Further, Perfect Money window that displays the current payment info is opened. 6. After Confirming the payment, you are directed to the Payment in ALFAcashier Successfully Completed page. Congratulations! Your order has been fulfilled! For your convenience, a message with detailed information of the completed order will be e-mailed to you. After successful payment, you can provide your feedback. Your opinion is very important for us!